This study was more on the implementation of corporate communication via videoconferencing than on the actual communication. Still useful and interesting. Do you have these principles in place in your school? Do you have a principal/ administrator supporting the implementation of videoconferencing in your school? What does that support look like? Are a lot of people getting skilled with using VC? Can your teachers mute & unmute? Can they use presets (if they are set for them ahead of time)? Can they dial if they are given the IP? How do you organize and publish schedules? Is your system working for you? Are interesting and innovative ways of using VC celebrated and communicated? What else do you think is important for implementation? This post is part of a series inviting discussion, comments and reflection on the results of my dissertation. Another major part of my study was to create a model to predict the use of curriculum videoconferencing in schools. I selected a combination of variables that were significant in the correlation analyses or the multiple regression analyses which gave a more complete picture of the implementation of videoconferencing. This graph shows the multiple regression B weights for each variable. Think of it as how much that variable contributed to the school’s use of videoconferencing while all the other variables are held constant. You can click the graph to see it larger. Here are the B weights and their significance for each of these variables. This is the last post about my research. What did you learn? Do you agree with the results? Why or why not? How will you apply these results in your work? Are these results useful to you? How so? What else would you want to know to inform your work? Please comment! Thank you for taking the time to think about and comment on my research! Owston (2007) created a model that suggests components necessary for the sustainability of a technology innovation in schools. I used this model as the theoretical framework for my study. I included all of his essential and contributing conditions except for the student support. You can see how the two connect with this graphic. Click the graphic to see it larger. Does your current implementation of technology (any technology) include these components? Do you agree that they are critical to sustaining the innovation? Now that you’ve seen this, how might you improve your current technology implementation? Remember as you review the results of my study that every variable was examined to see its relationship with how often the school was using curriculum videoconferencing and whether that variable could be used to predict the use of videoconferencing. A major part of my study was the development of a scale for coordinators with questions related to their skill in coordinating VC and the staff attitudes about videoconferencing. For those interested in the details, the K12 Curriculum Videoconferencing Implementation Scale has good reliability and validity estimates. Cronbach’s alpha was .815, which means the scale can be used to predict a school’s use of videoconferencing based on an individual coordinator’s score. For full details, see p.55-59. To see the full scale, see Appendix A, and questions 27 through 51. In this post, we’ll look at the relationship between subscales and the school’s use of curriculum videoconferencing. The quality of the videoconference was not significantly correlated to the school’s use of VC. However, when it was included in multiple regression analysis with all the subscales (which hold all the other variables constant), the quality of the videoconference contributed negatively (b=-12.34, p=.002) to the prediction of the use of VC. The coordinator’s ability to support VC was not significantly correlated to the school’s use of VC. However, it was significantly correlated to the coordinator’s ability to work with teachers (r=.471), the teachers’ attitudes (r=.238), and the principal’s support of VC (r=.177). And these in turn were correlated with the school’s use of VC. The coordinator’s ability to integrate VC in the curriculum was not significantly correlated to the school’s use of VC. However, it was significantly correlated to the coordinator’s ability to work with teachers (r=.688), the teachers’ attitudes (r=.296), and the principal’s support of VC (r=.176). The coordinator’s ability to work with the teachers was positively correlated with the school’s use of videoconferencing (r=.139, p=.021). The coordinator’s perception of the teachers’ attitudes towards videoconferencing was positively correlated with the school’s use of videoconferencing (r=.405, p=.000). The coordinator’s perception of the principal’s support of videoconferencing was positively correlated with the school’s use of videoconferencing (r=.320, p=.000). Why do you think some schools with better quality of videoconferencing are using it less than some schools that have more pixelation and breakup in their videoconference? This was one of the surprising findings of my study. Have you noticed that? I have some schools that have awful quality and yet their need is so great (very rural; not very many opportunities) and they love VC! Isn’t it interesting that the coordinator’s ability alone isn’t enough to get the school to use VC often? The teachers make a big difference! But… good VC coordinators find ways to encourage teachers to use VC. What are your most effective strategies to improve teachers’ view of using VC in the curriculum? Seeing that the principal support is so important to the successful implementation of VC, how do you gain that principal support? What strategies do you recommend? In this post, we’ll look at the relationship between the school’s use of curriculum videoconferencing and some more support variables. The choices were: a technical support person in my school, at my district, at my ESA or the vendor. Each of these answers was not significantly correlated to the schools’ use of videoconferencing. However, when using all the administrative reports in a multiple regression analysis to determine which variables predict use of videoconferencing, tech support from my ESA contributed positively to the regression model (b=67.06, p=.011). The speed of support that the coordinator received was not significantly related to the schools’ use of videoconferencing. Only two of the equipment locations were significantly correlated to the school’s use of videoconferencing. Schools with a mobile cart are using videoconferencing significantly more than the average of all the others (r=.156, p=.009). Where the coordinators support multiple systems in multiple locations, their schools are using videoconferencing significantly less than the average of all the others (r=-.159, p=.008). The schools that have mobile equipment are the only ones that are significantly satisfied with the location of the equipment (r=-.151, p=.012). None of the reasons for the location of the equipment were significantly correlated to the school’s use of videoconferencing. However, two of the reasons were significantly correlated to the coordinator’s satisfaction with the location of the equipment. Schools who placed the equipment based on ease of use for teachers were more satisfied with the location of the equipment (r=.278, p=.000). Schools who placed the equipment based on the only available room were less satisfied with the location of the equipment (r=-192, p=.001). Do you receive tech support from your ESA? It seems like this is an important piece, and could be because it is hard for overworked district tech coordinators (at least in smaller distrcits) to have the detailed knowledge necessary to make IP videoconferencing work on school networks. What do you think? Do you think there is an ideal location of equipment in a school using VC for curriculum enrichment? Are you satisfied with the current location of your equipment? Do you wish it was somewhere else? Do you agree with these results in your situation? why or why not? In this post, we’ll look at the relationship between the school’s use of curriculum videoconferencing and some administrative support variables. The hours the coordinator spent supporting VC at work was not significantly related to the schools’ use of videoconferencing. However, when using all the administrative reports in a multiple regression analysis to determine which variables predict use of videoconferencing, this variable contributed negatively to the regression model (b=-3.400, p=.050). This could be because full time VC coordinators are spread too thin supporting multiple units. The hours the coordinator spent supporting VC at home was not significantly related to the schools’ use of videoconferencing. The amount of funds that the school spent on programming was not significantly related to the schools’ use of videoconferencing. Whether or not the school had grant funds for programming was not significantly related to the schools’ use of videoconferencing. The amount of grant funds that the school spent on programming was not significantly related to the schools’ use of videoconferencing. Aren’t these results interesting? I think they are one of the more interesting results of my study. Why is the amount spent on videoconferencing not significant? Is it because some schools receive so much free programming (either from their ESA or from collaborative projects or both)? What does this say about the future and sustainability of content providers? What do you think?! As much as videoconference coordinators want more time to support videoconferencing, this isn’t significantly correlated to the school’s use of VC. Why do you think that is? What else do you think is more important in predicting the use of VC in schools? Now we start looking at the results of my study. Every variable was examined to see its relationship with how often the school was using curriculum videoconferencing and whether that variable could be used to predict the use of videoconferencing. This is why my questions about the method of measuring utilization are important. In this post, we’ll look at the relationship between the school’s use of curriculum videoconferencing and some school demographic variables. The elementary schools use videoconferencing significantly more than the average of the other levels (r=.280, p=.000). The high schools use videoconferencing significantly less than the average of the other levels (r=-.194, p=.001). Where the coordinators support all levels, their schools are using it significantly less than the average of all the other levels (r=-.202, p=.001). Poverty scores (National School Lunch Program, US only) are not significantly correlated to the school’s use of videoconferencing. The only ethnicity that is using videoconferencing significantly more than the others is the “other” category (r=.202, p=.001). Most of the coordinators who chose the other category wrote in Native American or Canadian First Nations (16 out of 22). If faced with a choice, install videoconferencing in elementary schools first. If you coordinate videoconferencing for multiple levels/schools, you need to train and support a VC coordinator in each school. Curriculum videoconferencing meets a particular need and is often used by Native American and Canadian First Nations schools with access. This should be supported & continued. Correlation doesn’t necessarily mean causation. You cannot say with confidence that because the school was an elementary school; that caused the school to use videoconferencing more. r is the measure of the correlation. In medicine, we want a very high r (close to 1 as possible); in education and other social sciences, we’re doing good to have it close to .5. Do you agree with the results? Would you recommend installing videoconferencing systems (with the purpose of curriculum videoconferencing) in elementary schools first? Is that where VC is available in your area? Why or why not? Do you think that it is important to have a VC champion/coordinator in each school? This is my first results post. Is it clear? Does it raise questions? Do you recommend another way? This set of questions tried to determine what type of support the coordinators in my study received from educational service agencies. An educational service agency provides support and services to local districts. Read more about them in the U.S. at the Association of Educational Service Agencies. In Michigan they are called ISDs or RESAs or ESDs. In New York they are BOCES; in Texas ESCs; in Wisconsin CESAs, in Pennsylvania IUs. ESAs represented in the study are listed below. You’ll notice that some of them are organizations other than an ESA including consortiums, statewide networks, and large school districts that offer services similar to ESAs. The organizations in Canada that stand out are Ontario’s ABEL, KCDC, and Alberta’s Regional Leads Network. How many of these do you know?! Do You Receive Support from an ESA? Does Your ESA Create and Facilitate Free Programming? Does Your ESA Subsidize Programming from Content Providers? What percent of your VCs from 2007-2008 were provided or facilitated by your ESA? Isn’t it interesting that this graph seems to show basically all or nothing with very little in between? Schools: What videoconferencing services do you receive from your ESA? What services do you wish you could receive? Schools: What services do you think are most essential from your ESA? 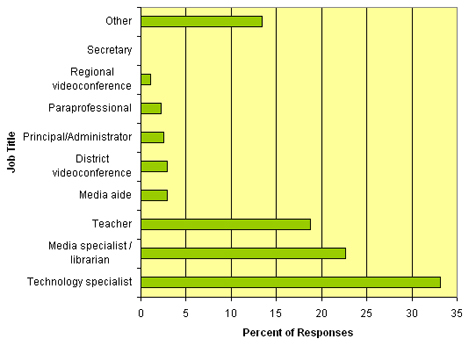 ESAs: What services do you think are essential to provide to your school districts? What types of programs should ESAs facilitate and provide? We continue an examination of the coordinator demographics of those who took my survey. What type of training do coordinators receive? The question was: What type of videoconferencing training did you receive? Respondents selected from the choices below. What training did you receive to be a videoconference coordinator? What training do you wish you received? What were (and are) your sources of continued learning? What do you see as the key components in learning to be a videoconference coordinator? We continue an examination of the coordinator demographics of those who took my survey. Who gets the responsibility of the videoconference coordinator and how much time do they have to support VC? Which job title best matches yours? Do you think there is a job title that is a better match for the videoconference coordinator responsibilities? When you talk to principals, which person/position do you recommend as the videoconference coordinator? How much time does it take for you to support videoconferencing? Do you think it should be a full time job – at the school level? District level? Regional level? Or is it ok to have VC mixed in with other responsibilities such as instructional technology?